Newly re-issued for 2008 on the Hieroglyphics Imperium label with 3 bonus tracks! You know you need it! 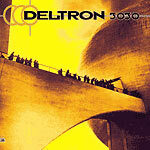 After doing an album with Kool Keith, Dan the Automator hooked up with Del tha Funkee Homosapien from Hieroglyphics and DJ Kid Koala on the wheels of steel to create the supergroup Deltron 3030 and by doing so delivered another phenomenal record. A concept album that pits Del's alter ego Deltron Zero in a futuristic backdrop in the fight against an oppressive world ruled by the major corporations of the universe. Featuring subtle contributions that feel more like cameos in a movie by Prince Paul, Mr. Lif, Paul Barman, Damon Albarn, Sean Lennon and much much more! Not only is this album a classic...its a cult classic and a must have for ANY Del fan!!! Produced by Dan the Automator. Turntables by Kid Koala. Pros: The Funky Homosa... oh excuse, me "Deltron Zero" evolves some more on this... possibly his best outing as a lyrical MC! Dan the Automator is crazy on the beats as he really pushes his sound. Amazing how the entire works as a whole theme. Cons: Tons of skits. For a reason some of them don't work. Was out of print for a while, but it's back in print so there's absolutely no excuse why you shouldn't own it! Overall: I really love this album, truly one of the best of the decade. Great concept, amazing beats, and Del is just amazing lyrically. What I love the most out of the album that it doesn't take long for itself to solidify the concept for the album with the classic track 3030, it truly architects the rest of the album for you. From then on the album just blooms and blossoms track to track. Half ways of the album your brain's just trying to make out a lot of the things that Del is talking about, it really sounds like hes just on a crazed out LSD trip! Production wise, the Automator is really on it! The entire thing sounds like a funkier version of a set of El-P beats. Beats and lyrics come in perfectly. This is the best album to cross someone over into hip hop. Poverty, control, virus... damn the "Future Development" doesn't sound too great. Screw it though. This album is still extremely amazing!